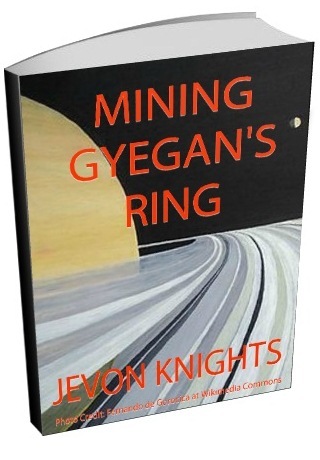 Then I started to write, and after several drafts and help from Skywriters, I created Mining Gyegan’s Ring. Here’s the basic idea of the world where everything takes place. 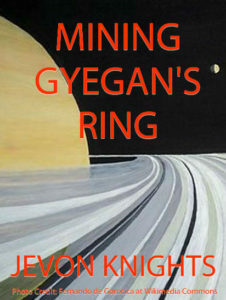 Centuries in the future, generations after asteroid cities develop in a solar system where basic resources are scarce, humanity finds itself with only one way to survive: by mining Gyegan’s Ring. Contractors have created a business out of this. They hire ships capable of storing vital cargo, and crew trained to pilot mining exosuits – humanoid machines that stand three stories high and are equipped with grappling arms and laser drills. But Gyegan’s Ring is no friendly place. Large, six-legged creatures feed off resources frozen in the rocks. They’ve found a new, more satisfying food source: humans. So the contractors also higher mercenaries capable of piloting assault exosuits. These huge machines are heavily armed with enormous rail guns. Missions to Gyegan might just be possible. The warning blared. Red dots filled a side of his radar display, started pouring in. As a mercenary, Hacker’s job was to protect the arrogant and annoying Nick, and ensure his mining exosuit made it back in one piece. In this slum of a solar system, the only way for humanity to survive is by mining the asteroids orbiting the red gas giant Gyegan. The cargo is precious – every ship needs it, every asteroid city needs it, all life needs it. Hacker didn’t care about all that. He just wanted his pay. Even with an assault exosuit, the job could get dangerous. The asteroids are foraged by gyegas, large insects with pincers powerful like a hydraulic press. One was easy shootings. Hacker had expected to see maybe two or three of them in this part of the ring, not hundreds. No amount of money was worth this. What was supposed to be just another routine mission to Gyegan’s Ring turns into a fatal encounter, and a startling discovery. Mining Gyegan’s Ring is a thrilling, action-packed short story, and I would like to give it to you, FREE. Just subscribe and download. That’s it.